Organised by NSA Scottish Region, the event will be hosted by the Clark family at Kinnahaird Farm, Contin, Strathpeffer, on Wednesday 31st May 2017. This is the third Highland Sheep event held by NSA Scottish Region, following the inaugural event held at Dingwall Mart in 2013 and last year’s event hosted by the Scott family at Fearn Farm, Tain. The one-day event is expected to attract a large attendance of sheep farmers from across the Highlands and Islands as well as from the rest of Scotland. Features will include a farm tour, trade stands, breed society exhibits, commercial and technical demonstrations, grassland management, seminars, wool shearing, wool spinning, sheep dressing, crook making, butchery and cookery demonstration, sheepdog trial, Shepherd of the Year competition, stockjudging and show and sale of ewe hoggs. Harbro national sales manager, David MacKenzie, described the Highlands and Islands as a key trading area for the company. “We are delighted to support this important event which will be a magnet for all sheep farmers,” said Mr MacKenzie. Kinnahaird Farm extends to 900 acres and carries a flock of 400 North Country Cheviot x Mule and Texel cross ewes and a suckler herd of mostly Simmental cross cows. 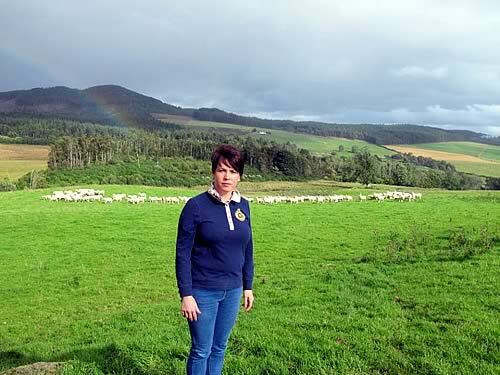 “The sheep flock is a very important part of our farming enterprise and we are currently engaged with Harbro in a number of innovative projects to improve the performance of the flock through both better genetics and nutrition,” said Ms Grant.